There were loads of bright spots in Ted Leo's 2007 album Living with the Living, but after the near-perfection of Hearts of Oak and Shake the Sheets, those spots seemed sort of overwhelmed, like a candle in the sun. Great tracks like "Colleen," "Bottle of Buckie," and the epic "The Toro and the Toreador" couldn't lift the album out of a feeling that it was overfull. There was just too much music packed into one album, with dub tracks and the anti-war anthem "Bomb.Repeat.Bomb." feeling almost out of place. When I read first reviews of The Brutalist Bricks many other reviewers gave demerits because the album felt less produced and somewhat regressive. But rather than call those characteristics failings, I applaud them. Ted Leo plays notoriously exceptional live shows. It's loud, powerful, driving music that makes you want to jump around and sign up to canvass Republican neighborhoods to try and create social change. But most of all, the music is fun, hook-laden and grinding. He and the Pharmacists always seem to churn out well-balanced albums that combine their power chord pummeling strengths with the more subtle, calming and beautiful acoustic stuff. Living with the Living did too many things outside of those strengths, and The Brutalist Bricks wonderfully brings all of those strengths back. A pleasing, shorter 41 minutes ushers The Brutalist Bricks in and out of your stereo without providing a lot of breaks. The opener "The Mighty Sparrow" feels like a classic pulled from Leo's earlier work with it's strong guitar hook, potent lyrics and up-tempo excellence. "Mourning in America" follows with a stylish, bass-heavy, drum-driven protest of political failure and the setbacks that Reagan (among others) thrust upon the country. "Ativan Eyes," which may well be the best track on the album rails against the drug industry. As you see, it's classic Ted Leo. There's a lot of frustration and anguish and action and protest rolled into a pleasing stew of rock and roll. And every song on The Brutalist Bricks is catchy, despite the overwhelmingly heavy subject matter pervading the album. Only "The Stick" is intentionally abrasive as a means of promoting the songs idea: The government wants you following tiny dreams, like getting groceries and buying things so you don't have the means or wherewithal to question bigger things. The sweet, more pop-centric "Bottled Up Cork" provides a moments rest, with a sweet, repetitive outro thick with drunken thoughts of love. (Even when Ted Leo is falling in love, he's drunk and sad about life and station...) The most surprising song, though is "Tuberculoids Arrive in Hop" that rides acoustic guitar and a distinctly retro feel until ending with only the sound of crickets. It's clear that Ted Leo and the Pharmacists are still just as experimental as they were with Living with the Living, but the execution feels so much more palatable this way. I've been talking about the way albums are reviewed a lot lately, usually around the end of my own review. I am trying to maintain the necessary self-awareness, so please excuse any sort of self-indulgent banality that follows. When an album like this one comes out, many critics begrudge it for not continuing the advance that was started on the previous album, but when a band does continue the advance, there seems to be an equal number of writers who can't grasp the dramatic change. I think that it's a trap, really. Sometimes, regressions are the best thing that can happen to a band. I think anyone who has listened to a Rolling Stones album since 1980 would attest to that. But, whether advancement or regression are even fair terms is another issue completely. Should an artist just create as their life and creative impulses drive them to? Do we all operate linearly, growing either definitely better or worse at something until we reach a point of plateau? I think, and that you'd agree, the answers are yes and no, respectively. Nothing in life really goes linearly (unless it's mathematics... and even then). Creativity comes in waves, and yes without practice, it never gets any more advanced, but that doesn't mean it doesn't get better. Love goes this way too. It doesn't necessarily go the way you expect, or want, or work hard to make happen, but that doesn't sully the experience, and it certainly doesn't mean that there's no additional reason to try. Were our lives critiqued as we do with our artists, many of us would stop creating and loving and learning altogether. 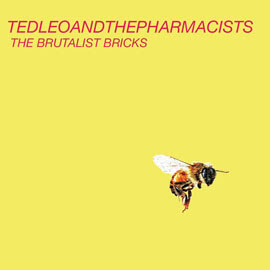 And with The Brutalist Bricks we see that Ted Leo still has the drive and power to write a potent, angry, erudite album, whether it looks like the last album, or jumps off from it at all doesn't really matter. In just the same way that one relationship cannot be compared to the other, we kill ourselves with expectations. Ted Leo has returned, better than ever, and as good as always.